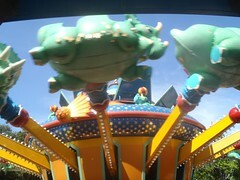 TriceraTop Spin is kind of like the Magic Carpets of Aladdin at the Magic Kingdom except you are flying in a Triceratop. Of course, it makes pretty much no sense. Sure, a flying elephant like Dumbo is odd, but at least that is based on a movie. 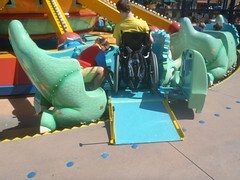 The whole flying land dino is totally weird, but gotta love that it actually is totally wheelchair accessible. They were not sure Mik's chair would work, but they were totally willing to try and if not there was a chair you could transfer to and ride in, although that would not work for Mik. 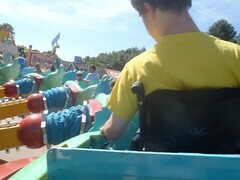 Luckily, though, Mik's wheelchair fit on the ride no problem. The control, however, is kind of awkwardly located on the left side. Mik had no problem since he is a lefty and he just likes to go straight up and stay anyways. He did think it would be better if it was in front of him like on Dumbo, but hey at least he did not have to transfer (totally dreaming of a wheelchair accessible Dumbo with the remodel by the way!!! ).